Two months ago we added a new app to the site: Questionably Epic Live. It promised to make Azerite armor easy for you. We wanted it to reduce the amount of time you spent looking through complex spreadsheets and trying to mix and match traits just to put forward your best performance in raid or dungeons. The response was greater than we could have imagined and now tens of thousands have run comparisons through the beta version of the tool. Yesterday we invited Mistweavers to the app and by the end of next week we’ll support a yet to be revealed third spec. 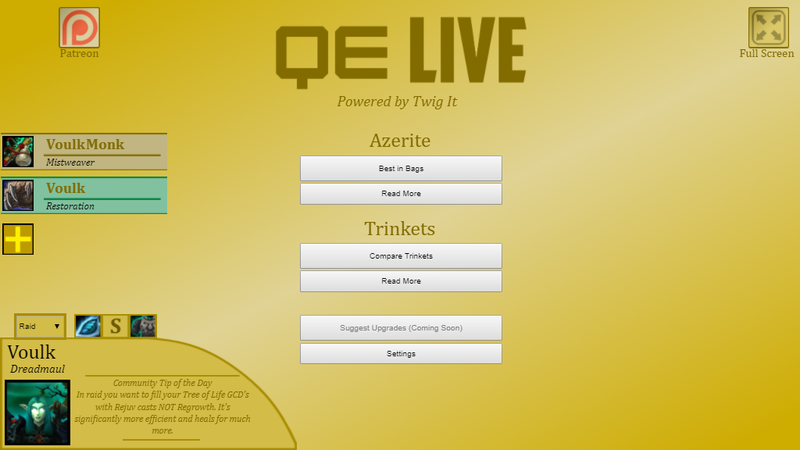 For those not familiar with QE Live, it allows you to input any Azerite Gear or trinkets that you own and it’ll tell you exactly what to wear. You don’t have to add anything up, or compare traits across a table. Just enter your gear and then equip it. Throw a log in if you want that extra 10% accuracy. Thank you so much to everyone who helped test over the last two months. Keep reporting any bugs you find and we’ll keep the accuracy of the tool sky high. QE will always house high quality guides and tools to make your life easier but running the site is expensive. I’ve created a Patreon so those of you who find the site useful can contribute to its long-term health and development. Multiple perks are included such as in-depth log analysis and big speed boosts to anything you run in QE Live to say thank you. You can find it here. The current slate of Mistweaver guides have been slow to update (including a famous example that hasn’t been touched since the BFA Beta) and so QE will temporarily host some up-to-date content (including the already live Mistweaver Azerite and Trinket guides). While they’re on the site they’ll be given the same frequency of updates as the Resto Druid content. This is an experiment and we’ll keep them as long as it makes sense to, potentially permanently. Welcome the new monks to the site. While the healing side of the site has flourished (pipe down), the Mythic+ half has become outdated and less useful as time has gone on. I’m partially blaming Blizzard here for changing dungeons a staggering 10+ times since the game launched but we’re going to get that taken care of. We’ll add long awaited boss guides for every dungeon, and we have full video guides on their way. You’ll also find Mythic+ resources for every class like links to the best guides, videos of recent high keys and streamers you should look for. As in Legion you’ll find it all on Wowhead as well once it’s live. Hey, I wondering Secret Infusion still bis for raiding ? Actually Burst of Life better then that ? can u explain why ? Secret Infusion should be better than Burst of Life in raid in almost all scenarios. is there a functionality for feral druids planned, top? I’ve added Feral Traits for Resto Druids wanting to DPS but I don’t have any planned functionality for Feral Druids specifically at this stage. I’d recommend checking out Raidbots for DPS looking for similar functionality. I wrote them myself. I actually mained Mistweaver in Uldir through to Hall of Fame. Tell them to flick their questions my way. I’m sure I can help convince them. Honestly none of the Mistweaver content is particularly rattling or controversial. Unfortunately the Mistweaver hub Peak was publishing poor and outdated information up until recently so I know there’s a lot of bad stuff out there at the moment. Hello! 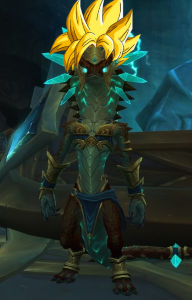 I was wondering if you could evaluate the engineering-only traits (Relational Normalization Gizmo and Ricocheting Inflatable Pyrosaw – https://www.wowhead.com/item=165896/charged-sp1-r1-73d-gearspun-goggles?azerite-powers=10) in the Mistweavers section… I’m apparently way too unlucky to get the CoL mythic head (TC + UL, I’d be ok with that) so I’m thinking about getting the engi head. Any thoughts about the 415 head being bad, decent, good or very good? The spreadsheet from PoS also doesn’t support log analysis for those traits. Sure, I’ve added them to the tier list. The engineering helm is also included in QE Live if you’d like to compare it to other helms you own.